If you would like to know more about other available Voice Assistants please visit 1Home Cloud and 1Home Box collection. For different gateways visit Supported Gateways. You need a Gira HomeServer version 3 or above or Facility server with configuredQuadclient visualisation. 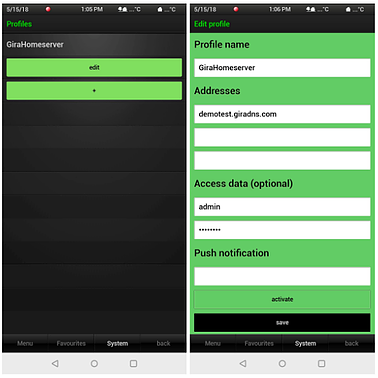 The server needs to be configured for remote use of the Gira mobile application. This configuration is usually done by a professional installer using the Gira software Experte. If you do not have the mobile app configured or have remote access then, please contact your installer. How do I connect 1Home to my Gira HomeServer (Gira HS)? Hostname or external static IP: Please enter the external address of your Gira HS. Example: mustermann.giradns.com. Please do not enter internal network IP addresses like 192.168.X.X, 172.X.X.X, or 10.X.X.X. Also please do not enter the http:// as part of the address and note that you need to enter the port number in a separate field. External static IP and other DNS address are also supported. Username: Please enter the Quad client username for your Gira HomeServer. Password: Please enter the Quad client password for your Gira HomeServer. If you do not remember the password please check with your installer. Press the "Save" button and if the connection details are correct, 1Home will recognize all your devices in your Smart Home. Click on the Devices tab at the top of the page to access the list of all detected devices. I don 't want to use port forwarding. What other options do I have? Which Gira HomeServer devices can be controlled through voice using 1Home? 1Home detects all HomeServer function templates available through your mobile app which make sense for voice control - lights, switches, scenes, blinds and thermostats. You can find a complete list of all supported commands in the Voice Control FAQ. We suggest contacting your installer to add new functions to your Loxone Miniserver configuration. After the installer adds new devices, please visit the 1Home dashboard at http://my.1home.io and press Save again. New devices will be detected and merged with already configured devices.